According to a recent blog post via ESPNBoston.com — the New England Patriots will kick-off their 2012 campaign on the road. Mike Reiss mentioned in his blog post that it’s likely the Pats will face one of the following teams in week one — Baltimore, Buffalo, New York, Miami, Seattle, Tennessee or Jacksonville. Of the seven teams listed above, which team would you want to see in the first week? Post your comments below or send us a tweet @NoontimeSports. It’s Thursday, which means we’re one day away from the weekend, so let’s buckle down and get some work done! Also, we’ll jumpstart the day with headlines and news, too! * The Boston Celtics eared their third consecutive win on Wednesday when they defeated the Utah Jazz, 94-82. 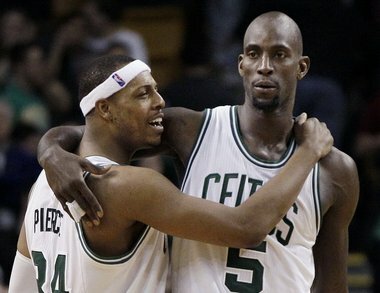 Kevin Garnett paced the Green and White with 23 points and 10 rebounds, while Paul Pierce tallied 20 points. Boston’s win set-up a two-way tie atop the Atlantic division with the Philadelphia 76ers. The Green and White will return to the hardwood on Friday when they travel to Minnesota. * The Boston Bruins will look to earn their 46th win of the season on Thursday when they host the Washington Capitals. The Capitals are currently locked in the ninth spot, and certainly need a win to keep their playoff hopes alive. However, Boston remains the second best team in the Eastern Conference, and is on par to wrap up the Northeast division. * According to sources – Chris Carpenter, who came to Boston via Chicago as compensation for Theo Epstein, is expected to have surgery to remove a bone spur from his throwing elbow. * Finally, New York Jets cornerback Darrelle Revis called New England Patriots head coach Bill Belichick a “jerk” on Wednesday on SportsCenter.